Great Gifts: Clinique Happy Heart Collection. Again this holiday season, Clinique is continuing its partnership with the Happy Hearts Fund, an international charity founded by model Petra Nemcova. This years beautiful “gifts with purpose” are adorable! This is the second partnership for Clinique and the Happy Hearts Fund and this year is even bigger. 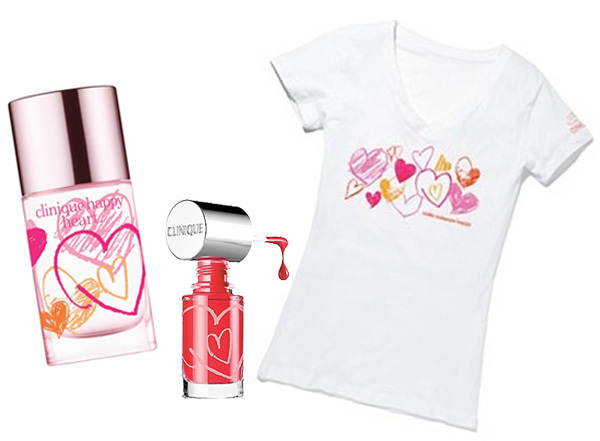 Clinique is offering a limited edition Happy Heart fragrance ($37.00); a Different Nail Enamel for Sensitive Skins in Happy ($12.50); and a chic, custom T-shirt that boasts the message “Make Someone Happy ($16.00).” A portion of each product sale will be donated directly to the Happy Hearts Fund to rebuild schools in areas affected by natural disasters. The limited edition Happy Heart fragrance is a scent that is both bright and floral with hints of sweetness from mandarin orange and cassis mingled with soft floral notes of water lily, rose and geranium. Dry notes of sandalwood, musk and blondewood create a harmonious balance meant to linger and enrich the heart. A Different Nail Enamel in Happy is a bright red-coral hue named after Clinique's loved fragrance, Happy Heart. It is the perfect color for the holiday season too. The limited edition Happy Heart fragrance and A Different Nail Enamel for Sensitive Skins in Happy are available at Clinique counters and clinique.com. The “Make Someone Happy” T-shirt is available exclusively at Clinique.com.